9 Comments on Digital footprint or digital tattoo? What does your online presence say about you? Is it a permanent reminder of an embarrassing night out? Or does it show off the positive journey you have made in your life? Digital footprint or digital tattoo? Apart from that not too much, phew! My creative online presence has increased over the past 8 weeks of my COETAIL journey. I was a consumer happy to “lurk” I had a passive digital footprint. I read information, watched videos, wrote the occasional email, I liked photograph’s on Instagram or Facebook. I am becoming a creator of content, I am shaping my online reputation by following people on Twitter; commenting on other peoples blogs (COETIAL and non-COETail) and I am sharing information to my PLN. After lurking for too long I am giving back; I am creating a positive active digital footprint. Your online presence is a modern day CV. Employers will look at your digital footprint to find more information about you. Daniel Newman stated 80% of employers scanning for potential recruits use social media. So when I surf the internet, look at social media, check sports results, look at emails, simply log on to the internet I am leaving a digital footprint. Maybe it should be called a digital tattoo; what you post online is difficult to erase. This can make life especially difficult for people who are simply messing around. Be respectful of friends, photos of them are their property. Ask them before posting. T: Is it True? H: Is it Helpful? I: Is it Inspiring? N: Is it Necessary? K: Is it Kind? These social and emotional ideas of respect, balance and safety are key ideas that run through everything that happens in the classroom. Children need to understand that good behaviour should be demonstrated online not just exhibited in the real world. Mark Barnes says Who knows what theirs is going to be, but they’re going to be creating content that’s going to be really important. I think teaching them at a young age how to do that effectively is really important. Currently in my class we are blogging using our platform Kidblog – the children are creating content and sharing their thoughts and ideas with the wider world. For our class of 6 and 7 Years olds this is the beginning of their digital footprint. We are about to begin a short unit of work named “Making Connections”. This will teach the children the skills to use social media in a positive manner, to comment and to look carefully at what they are posting. The project will allow the children to access the Out of Eden Learn Walk in January. I am interested in using twitter in the classroom. Jeff Utechts’s Reach talks about Ms. Hellyer tweeting about the temperature around the world to her followers. Ms. Hellyer showed the children the power of a network and a connected teacher. I am beginning a new unit named Structures and Materials, I would like to try this method with my students to give them an understanding of the gravity of the internet if used correctly. I am creating a digital tattoo but what will it say about me? Are you going to get one too? What will yours be like? Who is striking it rich or who is running on empty? I love seeing such a well-thought out plan for your students to understand what it means to be a digital citizen. I hope you record kids’ thinking about the process…I love hearing their voices! I do think we treat the internet as a type of boogeyman. Even the common sense media digital citizen seems like a passive citizen…reacting when negative things happen. Of course we should be teaching the negatives and how to react to them, but I think the idea of a digital citizen being a creator is so vital and it seems to be missing. Can’t wait to see what your kids do! I think it is so important that children realise at an early age about their role as a digital citizen. I am looking forward to hearing their thoughts and ideas. I will work on sharing some of their thoughts with you. I agree with the common sense media digital citizen poster – it doesn’t really give a true reflection of a digital citizen in the 21st Century. Maybe that is something that the children need to help create. Has anyone ever asked their opinions when creating something like this? Or is it adults who are shaping these posters and infographics? Perhaps we need to include their voice? I was going to say the same thing as Rebekah, the Common Sense digital citizen seems a bit responsive, not proactive. I’d like to add an arrow pointing to the mouth with a caption, “Shares opinions and discusses respectively”, another arrow pointing to the brain with the caption, “Learns from others about my passions, interests, and academics”, and yet another arrow point to the hand to represent connection and collaboration. Thanks for your post, I enjoyed reading it and the links you included. Thanks for your comments. I agree the Digital Citizen that I shared was not proactive. 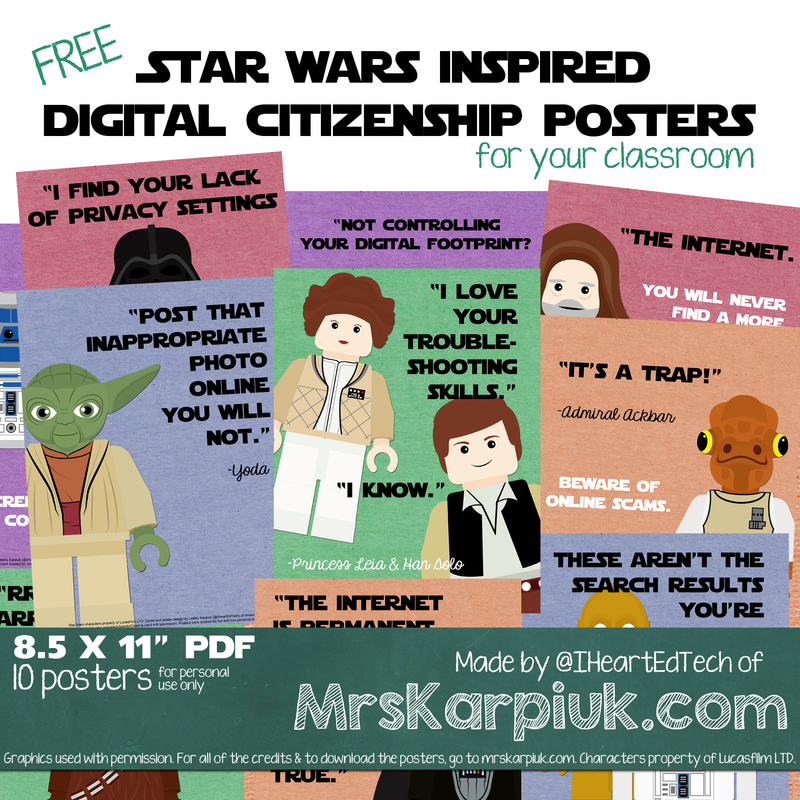 I have just found these online which look like good fun https://www.mrskarpiuk.com/wp-content/uploads/2014/07/starwars_digitalcitizenship_posters_preview.jpg but perhaps a little above the 6 and 7 year olds I work alongside! Coetail was good because it forced me to create a substantive positive digital footprint for myself. You can say things in an interview but there is a lot of credibility when it’s backed up by thoughtful writing in your bloghome. First of all, thanks for checking in on my blog. It’s great to hear from you, and I am thankful for the links you shared. I’m pretty sure that we don’t use O’s name in any pictures, but I’ll have to go back and look; regardless, alongside of Will Richardson, I do think it’s awesome to have the opportunity to mold our kiddos’ digital footprints, and if our minds are already finely aware of this task, perhaps we have a head start in helping them do the same. I enjoyed Googling myself as well, and found very much the same to what you found; I was surprised how my image showed up in Images from any profile picture on Pinterest, WordPress, and Facebook. I was also mistaken for a heap of lovely old ladies called Wendy Foreman – ha! Thanks for the comments. Yes it is a great opportunity to help build positive footprints for the children at home and at school. I agree that being part of this coetail journey will help us with this task. I looking forward to working with Twitter in my class, it will be very interesting to see how it goes. I am not expecting it to be easy but I think in the long term for them it will be a path worth travelling on.